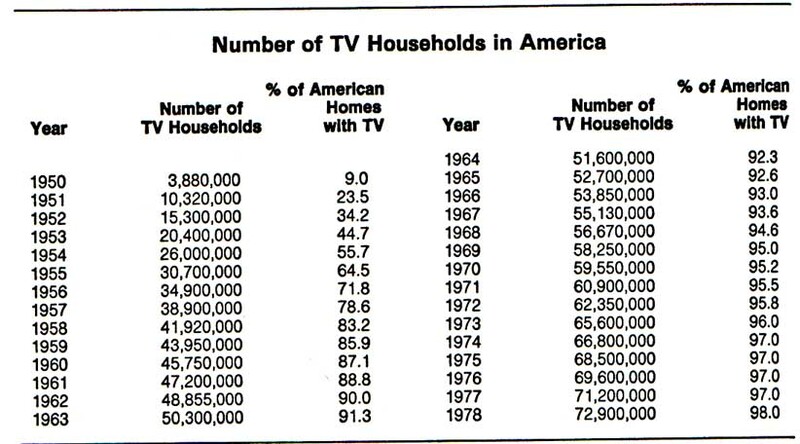 This data table shows the growth of TV ownership in American homes from 1950-1978. Home television ownership, a rarity during the 1940's, exploded in the post-war boom years of the 1950's. While only around 9% of Americans owned TV's in 1950, by 1960 that figure had jumped above 80%. The NFL was uniquely poised to take advantage of this new phenomenon going forward into the 1960's. TV History. 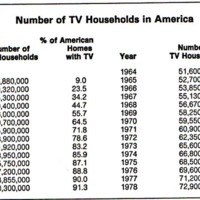 “Number of TV Households in America: 1950-1978.” Accessed November 15, 2014. http://www.tvhistory.tv/Annual_TV_Households_50-78.JPG , “Number of TV Households in America 1950-1978,” The American Century, accessed April 20, 2019, https://americancentury.omeka.wlu.edu/items/show/136.